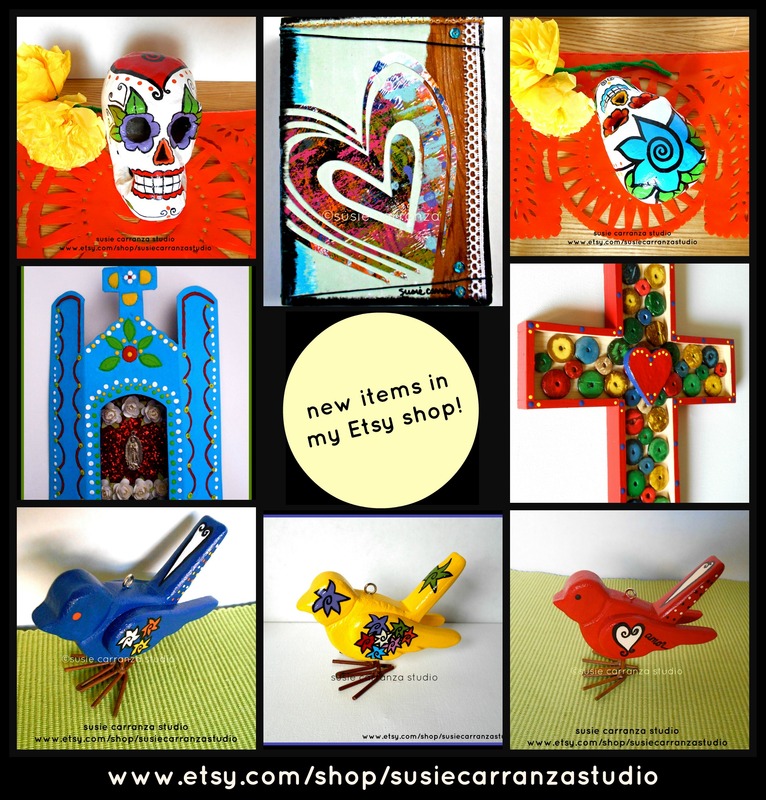 new items in Etsy shop! i’ve been busy! i’ve been happily painting away, into the early morning hours, and i’m loving it! anyway, i just wanted to share a few of the new pieces i’ve added to my Etsy shop. 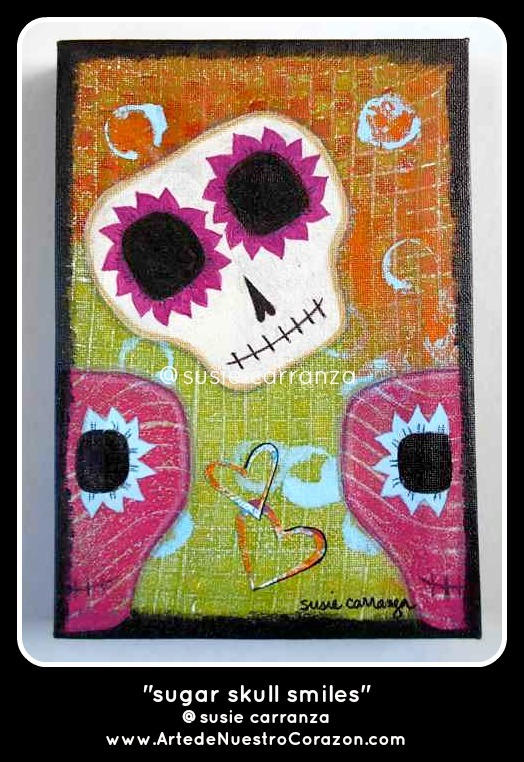 Dia de los Muertos is so close, and i added some one-of-a-kind paper mache skulls that would be great to add to any altar, or would make beautiful gifts for anyone who loves the culture, color, and beauty that is Dia de los Muertos. you’ll also find hand painted wood birds (fun & whimsical! 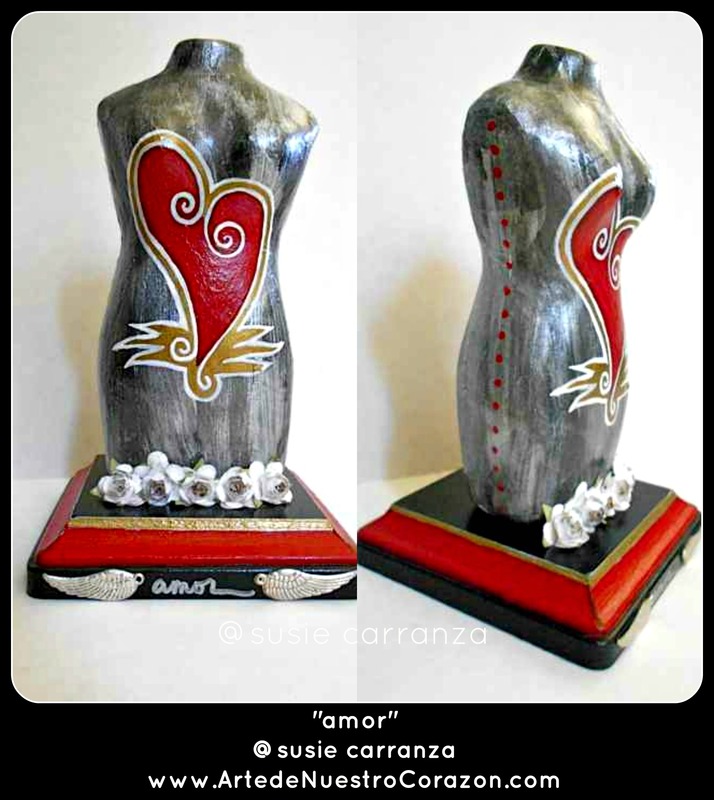 ), crosses, and original canvas paintings and mixed media pieces – and much more. so please – pop over to my Etsy shop now and see if there’s anything you like! it’s been a while since i’ve posted here. i keep telling myself i’m going to make a point of blogging consistently and then – life intervenes! i won’t bore you with personal issues, but i will share that i have been doing lots of painting, drawing, and adding work to my online shops. 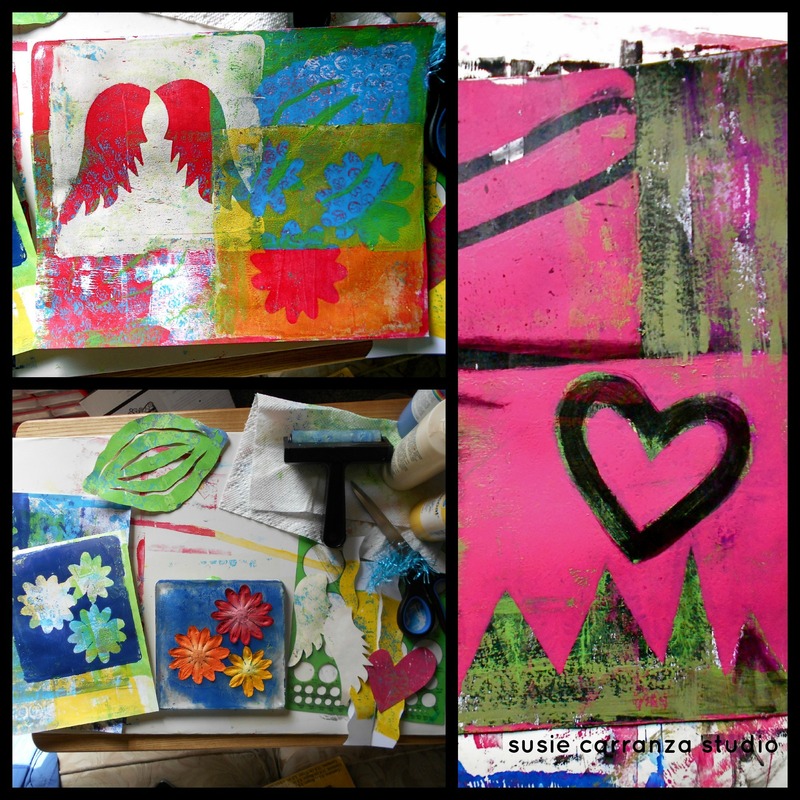 i’m still working with my Gelli plate – and stil loving it. there’s lots of videos & tutorials online about using your Gelli plate, but i find that lots of them use store bought stencils. 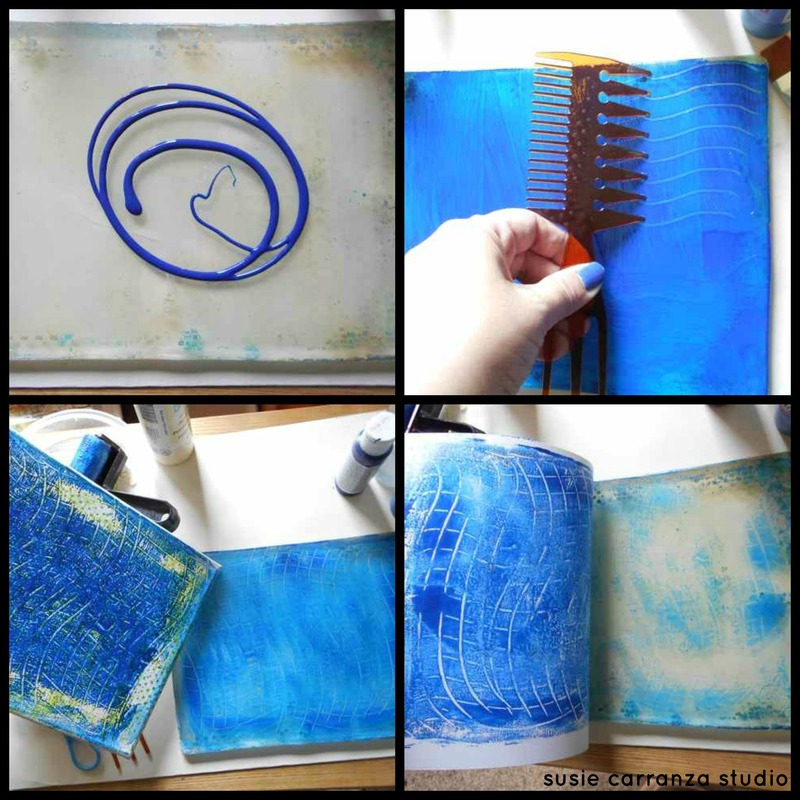 while there are some very cool stencils out there, i’ve come to find out that the most inexpensive, common household items can be used on the Gelli plate, with awesome results! 1.) a 99¢ store comb. you can create lines or waves in any direction you want with a comb and get some great texture and dimension. in the third photo, you can see what happened when i pressed a canvas onto my Gelli plate. in the final photo, i pressed a piece of white cardstock onto the paint that was left on the Gelli plate, getting another, different print – and cleaning up the Gelli plate at the same time. by pressing the shelf liner onto your Gelli plate, you get these tiny squares AND circles on it. the second photo shows you what happened when i pressed a canvas onto my Gelli plate this time. in the final photo, once again, i used cardstock to pick up whatever paint was left on my Gelli plate. 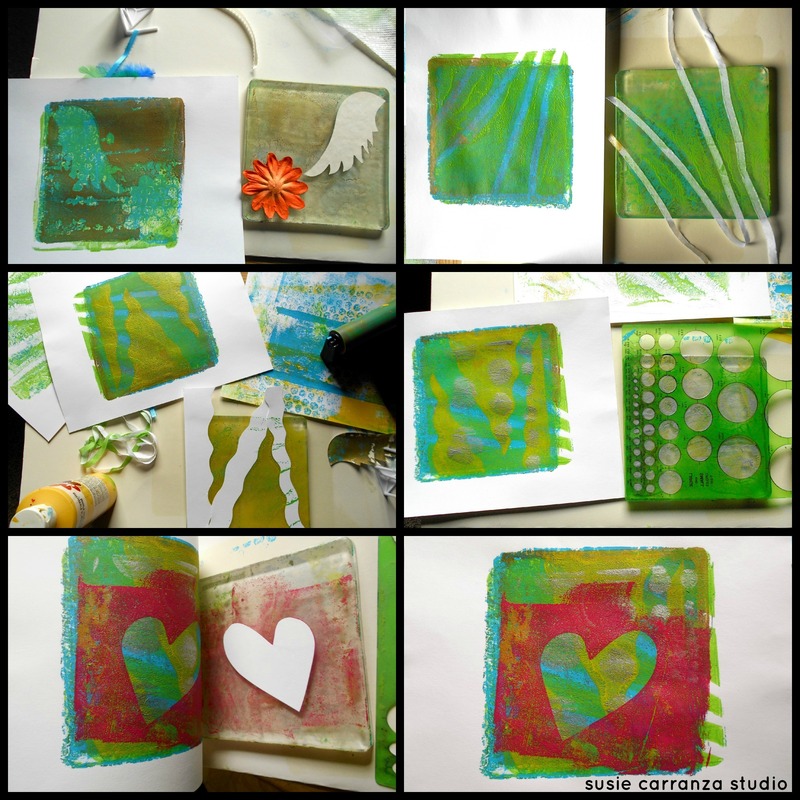 i love playing with different items on my Gelli plate to see what results i get. another thing i love to do is cut out my own shapes from cardstock. by cutting out exactly what i want, in the size i want, i create shapes and patterns personal to me, to use as backgrounds in my artwork. 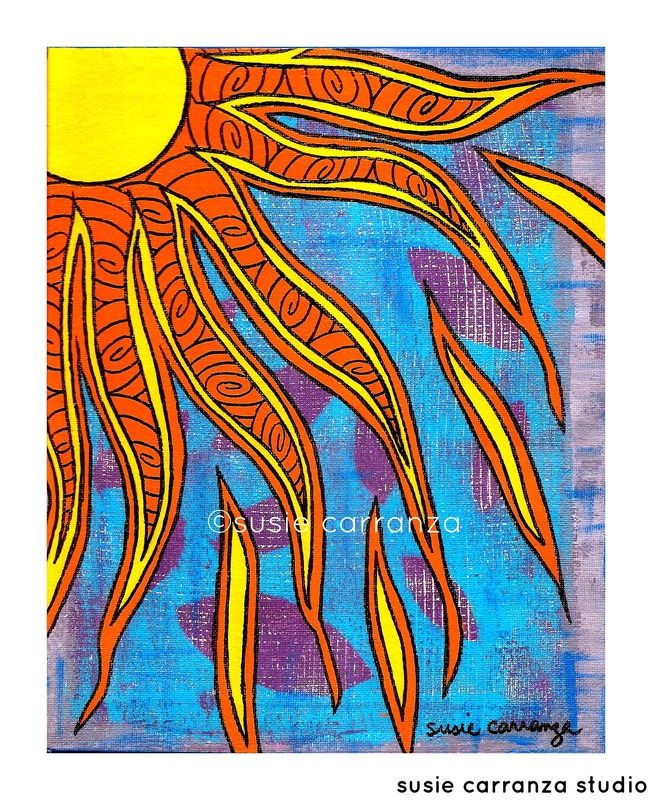 “Sun”: marker and acrylics paints on a Gelli print background. 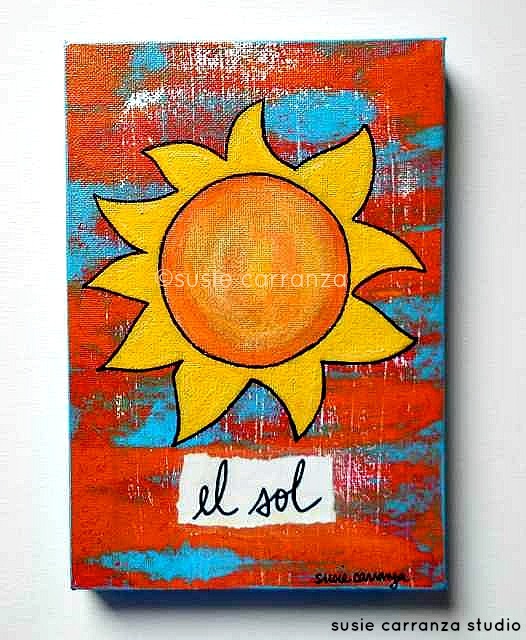 it’s available for purchase in my Etsy shop at www.etsy.com/shop/susiecarranzastudio. hope you’re all having a great summer – can you believe it’s JULY?! i won a Gelli plate on the Crafty Chica Cruise in April and i’ve had so much fun playing with it! i wanted to share some pictures from my first time using it. 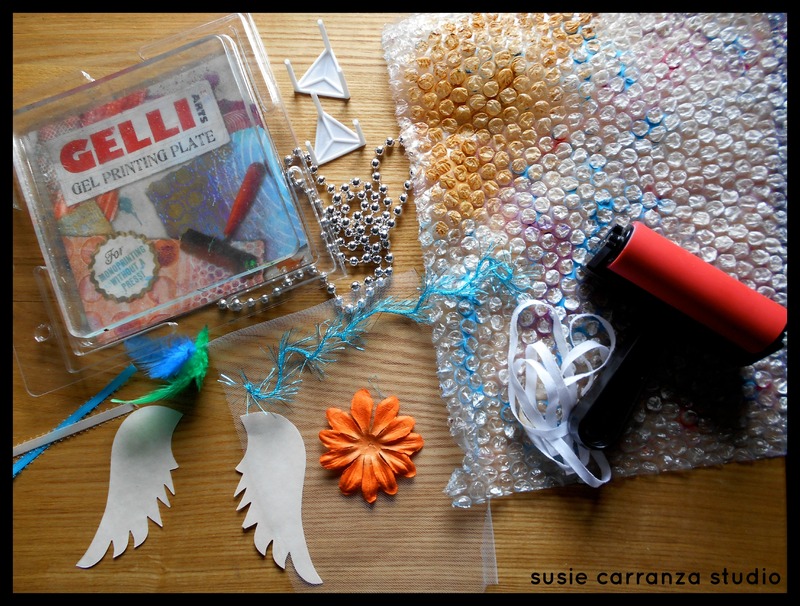 i started with gathering up some items i thought would make cool impressions: angel wing die cuts, flower shapes, ribbons, feathers, a piece of tulle, beaded necklace, bubble wrap (my favorite! ), and yes – those are the triangular thingies that come with your delivered pizza to keep it from sticking to the box. my favorite effects were the simplest items: bubble wrap, a simple piece of ribbon, and shapes i hand cut from card stock. the more i use my Gelli plate, the more possibilities i find. i can’t wait to start incorporating it into my mixed media pieces! the size i used here was the 6″ x 6″. well, this past weekend my husband bought me the next size up – the 8″x 10″ – as an early birthday present. i can’t wait to use it! we set sail on monday, april 22nd. i got to go on the cruise thanks to sylvia of Que Milagros Studio on etsy. her husband couldn’t make it at the last minute and she invited me to take his place! she called me on the 1 month anniversary of my father-in-law’s death, which was a very rough day around here. at the encouragement of my husband lawrence and my best friend annette, i told sylvia yes. 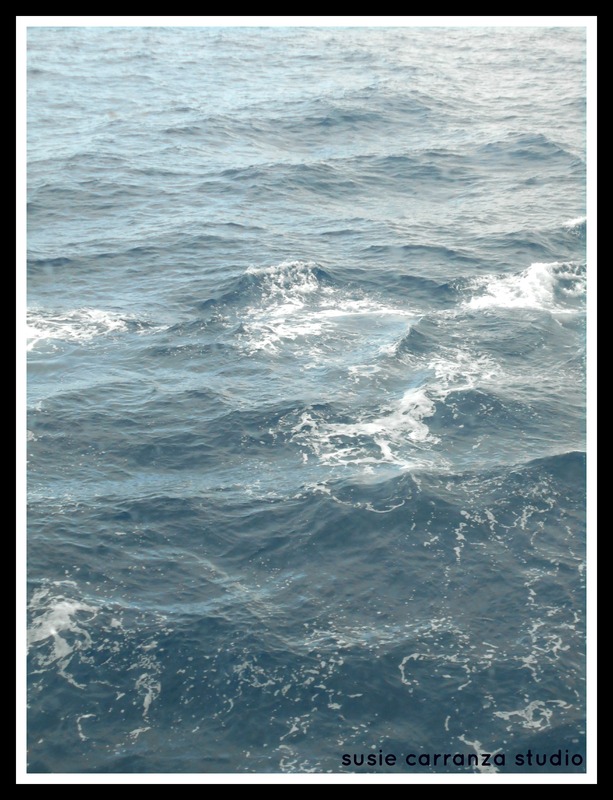 i’d never been on a cruise before, and let me tell you, the Carnival ship we were on – the Inspiration – was like Vegas! brightly lit, somewhat funky decor, clubs, bars, casinos…just one big party! hungry? thirsty? no problem – the Lido Deck offered breakfast, lunch, and dinner every day, with a variety of delicious options. dinner in the Carnivale (yes, Carnival with an “e”) dining room was fun: i got to sit with a group of very cool and funny women, our waiters were a blast, even performing for us a couple of nights, and the food was pretty good (desserts were yummmmy!). 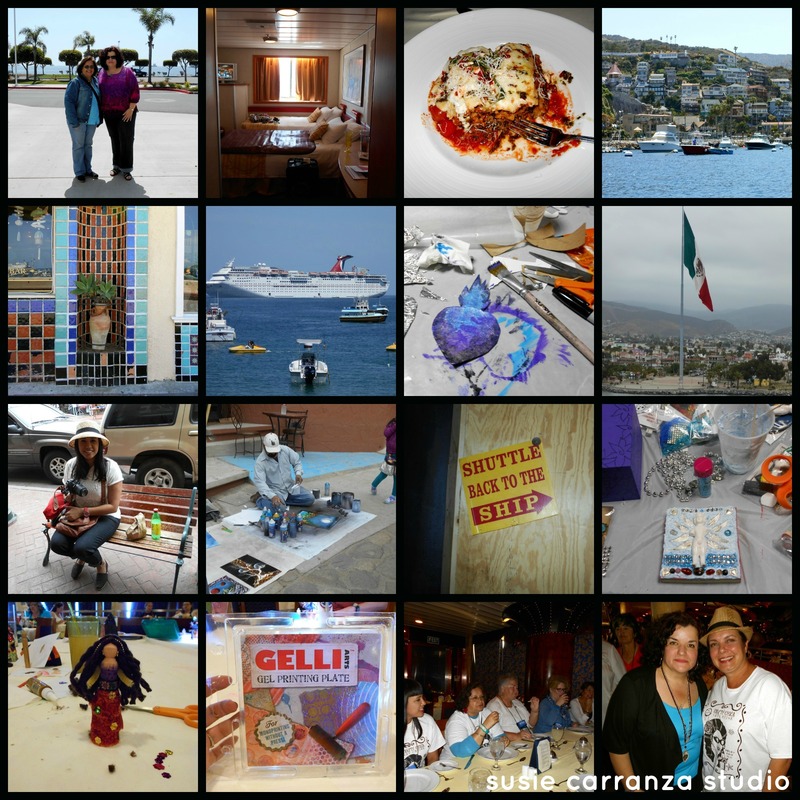 our schedule was docking in Catalina Island on Tuesday, and then Ensenada, Mexico on Wednesday. Thursday was all day on the boat; we returned to Long Beach, CA on Friday morning. i’d never been to Catalina before and i thought it was beautiful. fresh air, lots of beautiful mosaic tile work on the sidewalks and buildings, and of course, lots of businesses to shop at. In Ensenada, we stuck to the downtown area and did a little shopping. my favorite stop was at Casa Ramirez – beautiful, authentic art pieces made by local artists, with friendly and knowledgeable staff more than happy to talk about the items in their shop. if you’re ever in the downtown Ensenada area, i strongly recommend you visit Casa Ramirez! we did some crafting on the boat – my favorite workshops were the leather ring workshop, by Crafty Chica Kathy Cano-Murillo; the “La Chica Doll” workshop with Annette and Theresa Armas of CJ’s Angels; and the Sacred Heart workshop with Yoli Manzo of Sacred Yoli Designs. i only completed the doll and the sacred heart workshops; i’ll share more about the workshops themselves in a later post. i want to finish up the projects i brought home. oh – i won a Gelli Plate! have you guys heard about them? i first heard of them from Yoli on her facebook page. i’m so excited i got one and can’t wait to use it in my mixed media work!!! check out their site and see for yourself at Gelli Arts. the best part of the cruise was running into old friends, meeting Facebook friends in real life, and meeting lots of new people. i even got to meet one of my favorite artists, Emily Costello. 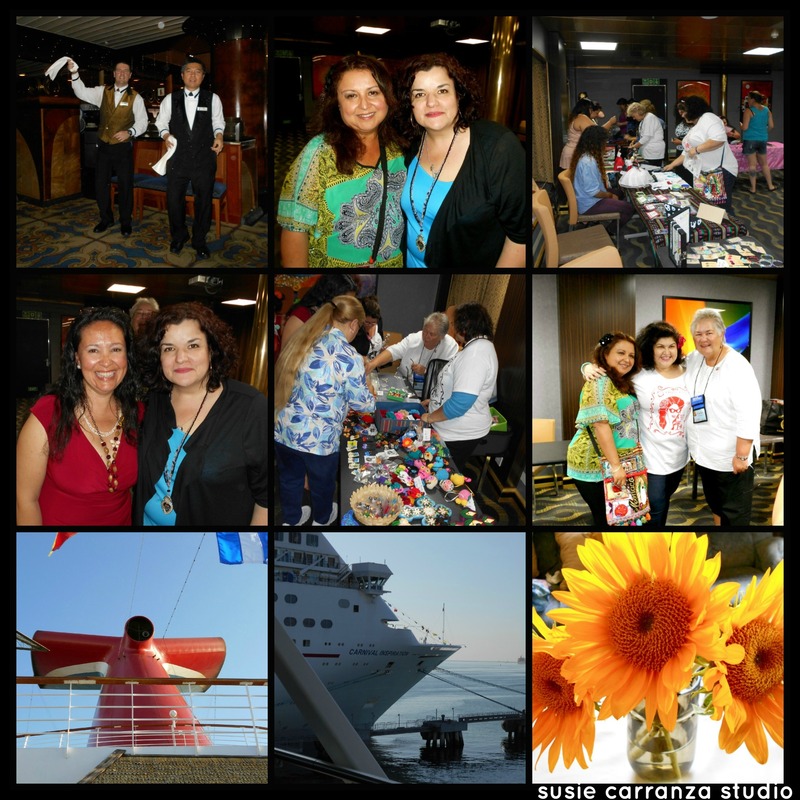 on Thursday evening, our last night on the ship, we had a “mercado nite”, where we had a chance to sell our homemade items, artwork, etc. i made back a good chunk of what i spent during the week!